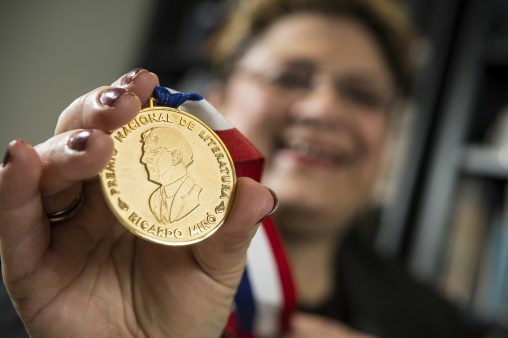 The Republic of Panama’s highest literary honor for the third time has been bestowed on Damaris Serrano, associate professor of Spanish at Wright State University. In her essay, Serrano traces the historic evolution of Panamanian poetry and literature from the Cold War to present day by analyzing the works of two Avant-Garde poets and the writings of a novelist in the Post/Postmodernity period. “This award is meaningful for me because I feel I have demonstrated that Panama has a very rich, diverse culture and can stand shoulder to shoulder with other literatures,” said Serrano. The competition, created in 1942, is named after Ricardo Miró, the national poet of Panama. Sponsored by the National Institute of Culture, it is designed to promote, preserve and disseminate Panamanian culture in the context of the Americas. The competition is anonymous, but candidates must have been born in Panama. Only after choosing the winner do the members of the jury — writers and personalities from around the Hispanic-speaking world — learn the recipient’s identity. At the awards ceremony, the juror from México invited Serrano to join the team that will write the “Encyclopedia of Ibero-American Literature,” contributing entries on behalf of Panama. Winners in each of the categories — Essay, Poetry, Short Story, Novel and Theatre — received a certificate, a gold medal, a monetary reward as well as publication and marketing of the first edition of the award-winning work. Serrano also won first place in the Literary Essay category in 2005 and 2013 and honorable mention in Sociological Essay in 2000 and 2002. Serrano grew up in David, a scenic Panamanian town tucked between the mountains and Pacific Ocean and part of an agriculturally rich province. She experienced a strong sense of community, with neighbors supporting each other, and she learned a lot about Panama when her family traveled the countryside on the weekends. Serrano attended Catholic elementary and middle schools and then a public high school, where she learned four different languages. Her late father, who studied architecture in college and later became a furniture designer and artisan with his own business, was a strong believer in education. Damaris Serrano also won first place in the Literary Essay category in 2005 and 2013 and honorable mention in Sociological Essay in 2000 and 2002. He filled the family home with books, magazines and journals. He even bought seven sets of encyclopedias. 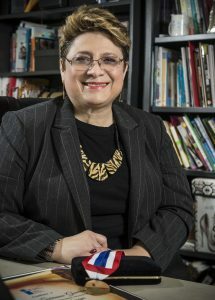 In 1979, Serrano enrolled at the University of Panama, where she absorbed the literature and culture of her native country. After graduating with bachelor’s degrees in Spanish and education, she taught for 10 years in public schools in Panama City as well as Jewish orthodox and Catholic schools. After winning several grants, she spent time in Spain to study languages and in 1997 was accepted into the Comparative Literature program at Michigan State University, where she earned her master’s degree in comparative literature and her Ph.D. in Hispanic cultural studies. Serrano joined the faculty at Wright State in 2005. Serrano says she loves her students and Wright State’s libraries. “My students are my children. And the libraries here are houses of knowledge and give you everything you need to improve your teaching,” she said. Serrano teaches Survey of Latin American Literature and the first levels of Conversation and Composition. She also conducts research into the literature of the Caribbean. She says Panama became a center of Caribbean culture because many professionals from Barbados and other Caribbean nations — including musicians and playwrights — came to help build the Panama Canal. The U.S. Library of Congress included Serrano’s first book — “Panamanian Literature: History, Nation, Society (Love, Culture and Conflicts in the Second Half of the Twentieth Century)” — in its 2014 collection/exhibit to commemorate 100 years of the Panama Canal. Serrano said her research shows that recent political upheaval around the world and advances in technology have resulted in changes in the way literature and poetry is written and delivered. “But what I learned is that no matter the aesthetics, the structure, the form that the art can take, underneath there is always a commitment to the soil where the person was born,” she said. However, Serrano also said that many of today’s young writers don’t think of themselves as citizens of one particular country, but rather as voices of global communities. And she says their literature has multiple layers, is rich in meaning and is amplified by the power of the Internet and social media.